The dreaded vinyl covered roof! I think the vast majority of car guys will agree that they are the work of Satan, himself. It’s only speculation, but I’m guessing somewhere around the early 1960s, the Prince of Darkness might have looked at the progress we had made with the automobile and said “It’s time these pathetic minions started glueing pointless sheets of plastic to the roof panels of these four wheeled contraptions”, and the vinyl roof quickly became the toast of automotive high fashion. The devil knew what he was doing as other atrocities were soon to follow, such as the “Landau” roof, “Opera Windows”, and last but certainly not least- copius amounts of roof rust laying in wait underneath these unholy scraps of ugliness. All was going well with the Evil One’s plan until 1969, when Chrysler introduced the “Mod Top” vinyl top option, available on everything from Dodge and Plymouth muscle cars, to Chrysler luxo-barges. The minions had struck a blow using the number one rule of automotive bad taste: The only way to fight hideousness is with more hideousness. 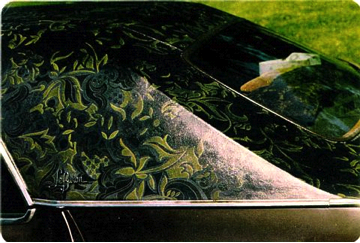 The Mod Top was available from 1969-71, and options for Mopar’s muscle cars and economy cars consisted mostly of psychedelic flower power’esque type vinyl pattens, while the luxury cars could be ordered with paisley prints to rival the worst silk shirt you’ve ever seen, and some floral prints that were reminiscent of your grandmother’s living room curtains. 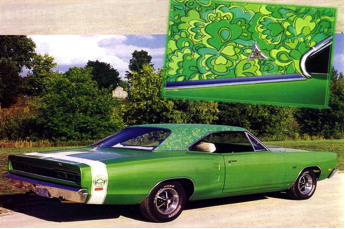 And what if you weren’t a Mopar fan in the early 1970s, but you still wanted in on the gaudy fun? 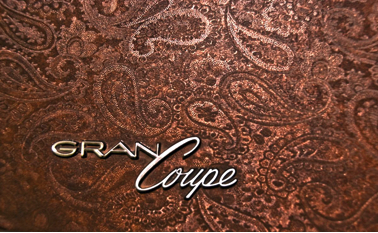 Worry not, because you could’ve strolled into your local Ford dealer and ordered a Mustang Grande or Mercury Cougar with an ultra chic houndstooth vinyl roof. 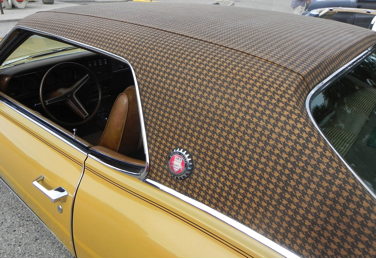 There’s even a rumor that a few Pintos were optioned with a paisley print vinyl roof of their own. Just like an English Bulldog- It’s so ugly, how can you not love it? I for one say “Thank you, Ford and Mopar!” for taking the reviled vinyl roof and making it so unbelievablby ghastly, that somehow it actually went full circle and became cool again.